I perform all consultations and procedures, guaranteeing patients receive tailored treatment plans and aftercare, benefiting from my wealth of experience and years of accumulated knowledge and research. 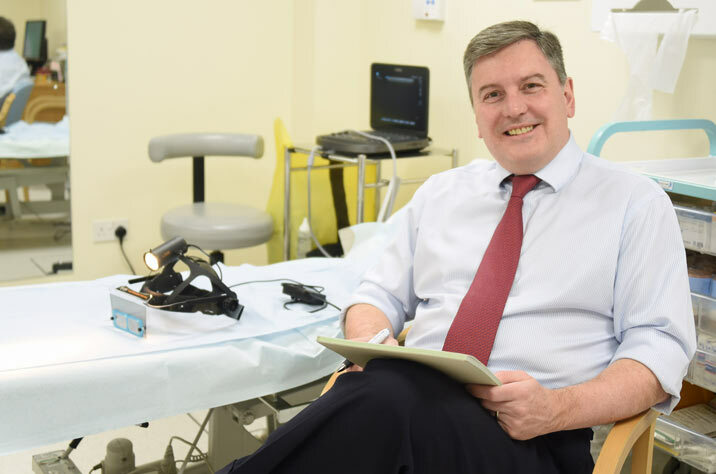 Internationally renowned Michael Gaunt treats unsightly varicose veins, thread veins, spider veins and facial veins including infected venous ulcers and deep vein thrombosis (DVT). Specialising in varicose vein & thread vein treatments using Endovenous Laser (EVLA), ClariVein™ (MOCA), Ultrasound Foam Sclerotherapy (UGFS), Michael Gaunt offers the latest technology and very effective treatments. All procedures are performed within a hospital setting with the choice of local or general anaesthetic. Consultations can take place at any one of Michael Gaunt’s private clinics in Harley Street, London, Cambridge, Bury St Edmunds or Norwich. ClariVein™ A tiny rotating wire is inserted inside the varicose vein whilst a sclerosant solution is injected to break down and seal the vein. This technique is the least invasive, requiring the smallest amount of local anaesthetic. The procedure takes around 30 minutes per leg. Endovenous Laser (EVLA) A laser fibre is administered inside the vein. The laser heat penetrates the vein wall and as it is withdrawn up the leg the vein is destroyed. The procedure takes around 30 minutes per leg under local anaesthetic or general anaesthetic according to patient preference. Foam Sclerotherapy A foam is injected into the veins and this causes them to collapse and fibrose. Ultrasound guided foam sclerotherapy can treat obvious varicose veins as well as incompetent long and short saphenous veins causing underlying problems. The procedure is performed in the Outpatient Clinic. Radiofrequency heat is used to close the varicose vein via a closure catheter. The catheter is positioned into the varicose vein through a very small incision in the skin. This treatment is also known as endovenous thermal ablation and Radiofrequency Ablation (RFA) of varicose veins. A safe and effective treatment designed to decrease the visibility of unsightly skin veins most commonly found on the legs by injecting a solution into the veins with ultra-fine needles to ‘close’ the vein. A small pulse of high frequency electrical current is delivered via an ultra-fine needle closing the vein through heat. General information on underlying causes, and various conditions. Vascular surgeon Michael Gaunts’ personal consultation and expert care. During your consultation a full assessment is undertaken with an ultrasound Duplex scan to identify the problematic veins and recommend the best procedure and treatment plan for you. Renowned patient care and effective varicose vein procedures are backed by the assurance of post-operative care and support. Everything you need to know from treatments, after-care and the consultation process to the best way to pay for your treatment.